It’s time to target the debt. The world is a dangerous place, but our greatest threat lies here at home in the form of our $19 trillion national debt. Borrowing trillions of dollars is making us less safe by hurting the American economy and threatening our ability to fund a strong national defense. That’s why we’re pushing Washington to finally enact smart reforms to cut the country’s enormous deficits and to start paying off our $19 trillion national debt. The United States’ national debt is currently over $19 trillion and that number is growing every day. Much of our current debt comes from recent spending with the national debt growing by about 81 percent since 2009. Yet, despite claims that more government spending helps the economy, since 2009 median incomes have fallen, poverty has increased, and labor force participation has declined. America’s military strength is directly connected to our economic strength. America historically would not have had a technologically-advanced and well-trained military were it not for our strong economy and free markets which encouraged innovation and allowed the rapid expansion of our armed forces during times of war. But our debt is threatening the American economic engine, which has always been one of the sources of our military’s strength, by risking massive interest rate increases and shaking investor confidence in the United States’ economic stability. Furthermore, if our debt continues to grow at its current pace, by 2021 interest payments on the debt will exceed spending on national defense. We are seeing how an unsustainable national debt can negatively impact a nation’s national security in Greece. Years of reckless government spending created a fiscal and economic crisis for that European nation that began in 2011 and which is still ongoing. The fiscal crisis has become so dire for Greece that they cannot even afford fuel for their nation’s fighter jets and naval vessels – even as their long-time foes in Turkey are more aggressively violating their airspace and territorial waters. 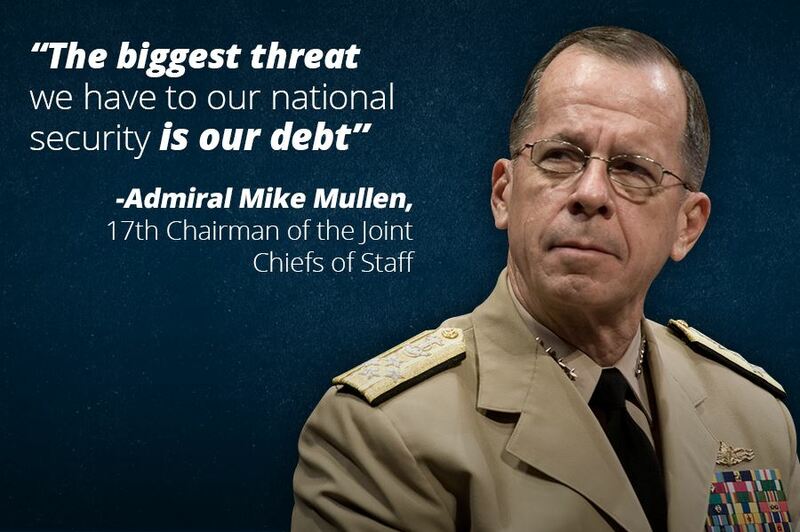 It for these reasons that prominent military leaders like legendary Marine General James Mattis and former Chairman of the Joint Chief Staff Admiral Mike Mullen have called our national debt one of the greatest long-term threats facing our nation. With all this taken together, there is absolutely no excuse for Congress and the President to not take this very real national security threat more seriously. Fortunately, there are responsible and smart reforms that Washington can enact to start reducing the threat of out an unsustainable national debt. Reform entitlement and mandatory spending programs like Social Security and Medicare to both preserve them for future generations and reduce their long-term impact on the debt. According to the Congressional Budget Office (CBO), mandatory spending programs (which include Social Security and Medicare) plus interest payments on our debt will make up nearly 78 percent of all government spending by the year 2026. These mandatory spending programs also have by some estimates up to $100 trillion in unfunded liabilities and will be the biggest driver in the growth of national debt in the future. Any serious plan to reduce our national debt must reform the entitlements and mandatory spending programs in a way that reduces the burden they put on our nation’s finances while preserving the programs for future generations. Return certainty to the budget process. Another step toward getting our debt under control is a functional budget process, in which Congress passes a budget and all spending bills are debated and finalized in the public’s eye not behind closed doors and with little public debate. Congress and the White House often use budgetary sleights of hand and gimmicks to hide the true cost of government programs or to exaggerate savings from a particular budget cut. Congress and the White House need to end these dishonest practices and be truthful with the American people about the true cost of government. Only then can we truly begin to have an honest discussion about what it will take to reduce spending and our national debt. Balance the budget in ten years or less. The federal government has been on a spending binge since the beginning of the new millennium and Washington has not passed a balanced budget in nearly 16 years. Even worse, President Obama recently proposed a budget plan that would never balance the federal government’s finances. With our national debt reaching a critical level, it is imperative that Congress and the President enact a budget plan that would balance the federal budget in ten years or less. Any budget plan that proposes to balance the federal budget in more than ten years will add too much more additional debt and would offer too many opportunities for Washington to undo needed spending reforms.